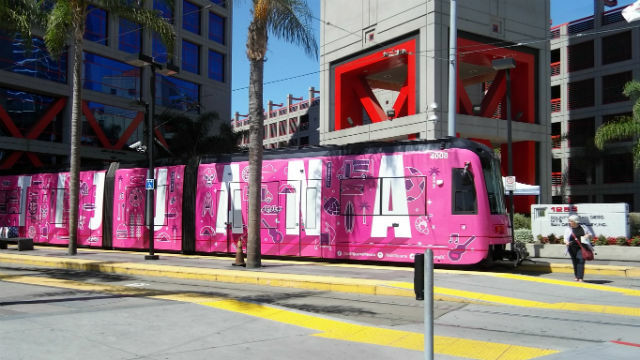 Baja California business leaders stood alongside their San Diego counterparts Tuesday to unveil a trolley car wrapped in pink that invites tourists to visit Tijuana. Trolleys on both the Blue and Orange lines are wrapped in a design by Tijuana artist Alejandro Michel that highlights the attractions of San Diego’s southern neighbor, from innovative cuisine to craft beer to soccer to the arts. The colorful pink and white wrappings will be visible on the lines through Sept. 31. 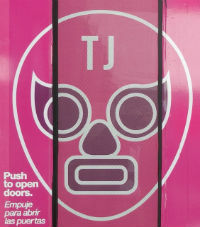 The Blue Line segment from downtown to the Mexican border, built in 1981, remains the Metropolitan Transit Systems‘ most popular trolley route, and an easy way to get to Tijuana. “Then it was affectionately known as the Tijuana trolley,” said Rob Shupp, director of marketing and communications for MTS. “Thanks to this great marketing campaign, there can be no doubt this is the Tijuana trolley now. He said the success of the line to Tijuana led to a renaissance in construction of light-rail systems in the United States. Oscar Escobedo, undersecretary of tourism for Baja California, said the $160,000 advertising campaign is part of an effort to raise visibility for the state, which is already popular with tourists. “We want our presence to be known here,” he said. Annual border crossings have hit 75 million as Americans vacation in Baja and Mexicans travel north to shop. 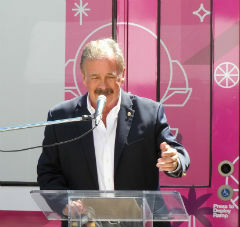 Joe Terzi, president and CEO of the San Diego Tourism Authority, said the trolley campaign is a sign of the growing cooperation between the two cities, and noted that the entire Cali-Baja region is being marketed to the rest of the world.